Oh me, oh my, where do I begin with this episode? As you can tell by the tone of that introductory statement, “Court Martial” has never been one of my favorite episodes. It’s not that the concept of the story was bad, but the execution was very, very lacking. 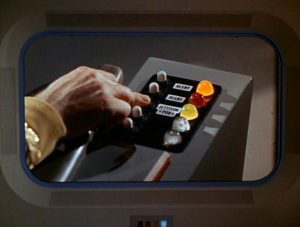 As suggested in the story, Captain Kirk pressed the jettison button himself. Why in all creation would he have that button conveniently on his panel? And for that matter, the Yellow Alert and Red Alert? And just how can a visual log be that detailed anyway? A lot of plot contrivance in my opinion. Also, at the end of the episode, they use a “white sound device” to try and isolate Finney’s heartbeat and establish that he isn’t actually dead. Dr. McCoy has to go through the process of eliminating everyone else’s heartbeats. It has been established in previous episodes that the Enterprise can scan and find people on planets, but why in the world can’t they scan their own ship and find a nefarious crewman that has gone rogue? Very confusing. There is a good story in there, but I don’t think it was presented to its fullest potential. Not one of the better episodes of the first season. I can see why the powers that be wanted to hold it back for telecast at the end of the season.